Change can hit a young person gradually or in an instant. When change happens outside, they will be pushed to change inside. It happens automatically. Facing transitions is hard but inevitable. 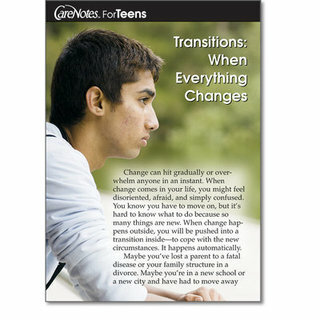 This Carenote outlines some simple tools to get a teen through a transition with grace and strength. First, Reach Outside Yourself! Then, Reach Inside Yourself! Always Remember Everyone Makes Mistakes. Transitions are temporary. Now Look Ahead! Remember that right now you are achieving a small goal that is part of a greater plan for you. by Christine A Adams, M.A. It's tempting for the friends and families of recovering addicts to believe that the past is just a distant memory, never to be repeated. But the truth is that relapse is a common experience for many—and while loved ones can't predict an addict's relapse, they can help put him or her on the path back to recovery. 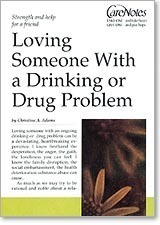 CareNotes author Christine A. Adams shines a light on this sensitive subject in helpful sections entitled: "Facing the initial family denial and fears," "How and why relapse happens," "Denial in the alcoholic/addict," "Prescription drugs can be the gateway to relapse," and "Get help early." She closes this CareNote with the reminder that God is the ultimate source of help for a situation as difficult as this. Writes Adams, "Remember, it's by the grace of God that the alcoholic came to sobriety and it will be by the grace of God that they return to sobriety." 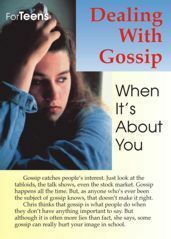 People dealing with intensely emotional situations are looking for concise, easy-to-read guidance and support. That's why Carenotes have been designed with smaller, more manageable sections. Sidebars are added to support the information and stimulate interest; attention-getting subheads and call-outs are included to direct a reader through the booklet; and a thorough resource guide is supplied. Newly brought back to production at Saint Meinard Archabbey- available at www.carenotes.com and on their facebook page!!!! 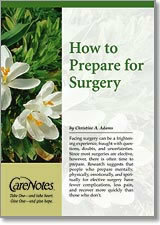 Over the years hundreds of Carenotes have been written by various authors - and millions of people have picked up a Carenote in hospitals, churches and other institutions across the country. 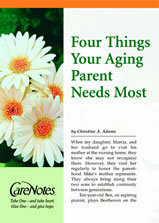 For nearly twenty years Christine Adams has been writing carenotes for Abbey Press. She has written about addiction, spirituality, health and aging issues. She has also contributed to the Teen Notes section.